With the little man due any day now, the bloke and I have managed to fit in a final date night. Chiquito's invited us to try their new menu and it could not have come at a better time! Dylan was put to bed and Grandma was left in charge, and the bloke and I got to enjoy some quality time together! Pregnancy is the perfect excuse to be a little greedy and I must say our order was optomistic! There were so many things I wanted to try as well as the favourites I already have, so we went for a mixture. I love the fact you are greeted with popcorn when you sit down as it makes taking your time with the menu that bit easier. We ended up going for a hot cheese starter that sounded like heaven as well as the nachos which I already know to be highly addictive. Hot cheese was exactly what it sounds like and was quickly devoured (mostly by me) lathered on tortilla chips. Both starters are very good sizes but of course there was more to come. For my main I had the classic chicken fajita (can't go wrong), whilst the bloke had a pulled pork Burrito on the waiter's recommendation. We had some chips, sweet potato fries and onion rings to accompany it and our large table was full with food! The fajitas were delicious and although the portion seemed a bit smaller than the old size was still more than enough and very generous. The burrito looked delicious and the bloke managed to wolf it down. He loved the flavours but would have liked more meat and less rice in there. Sweet potato is one of my favourites and I would highly recommend the sweet potato fries - absolute perfection with a side of sour cream for dunking! Of course it would be rude not to finish up with a desert and being a bottomless pit I devoured a gorgeous slice of honeycomb cheesecake - definitely worth keeping space for! The bloke at this point was feeling a little defeated and went for some ice cream as it wasn't too heavy. There was a good choice of flavours and it came in a lovely cinnamon basket winning points on presentation and taste! We really enjoyed our meal - the food was delicious and not having grubby toddler hands trying to steal the best bits was a bonus! We need to go back with the little dude soon so he can try out the new children's menu, although if we order this much next time I am sure we can find a few bits to share with him! 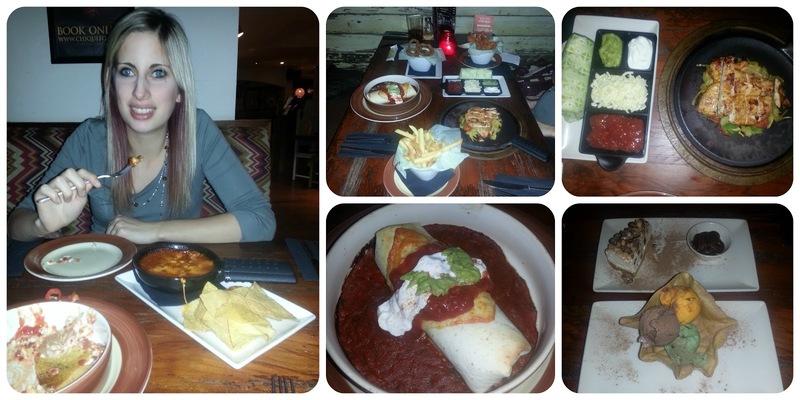 Disclaimer: I was provided with a voucher for Chiquitos for the purpose of this review. All thoughts and opinions are my own though. Looks like a pretty good last date night to me! The food looks yummy, particularly hot cheese on tortilla chips. MMmmmm.